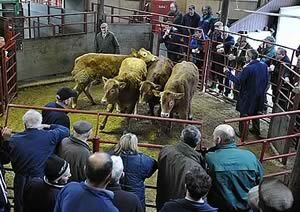 The Cumberland & Dumfriesshire Farmers Mart PLC had forward 46 Store Cattle on Tuesday 4th December, 2012. A smaller plainer show of store cattle saw trade continue to meet late high rates. Top price of £750 (x3) for Simmental bullocks shown by T.D. Barker & Co., Old Irvine with breeding cattle selling to £1,290 for an Angus cow with Limousin bull calf from J.G. & C. Tailford, Rinnion Hills. Simmental - £750 (x3) Old Irvine. Longhorn - £740 (x3) Mossband House. Blue Grey - £725 (x2) Old Irvine. Charolais - £590 (x2) Greenleycleugh. Shorthorn - £560 Greenley Cleugh. Angus - £550 (x3) Spadeadam. Angus cow with bull calf - £1,290, £1,230, £1,210, £1,160, £1,110 Rinnion Hills. Angus cow with heifer calf - £1,090, £1,010 Rinnion Hills.